Ferocious Dog have been described as England's best folk-punk band, they tour relentlessly and most of their gigs are sold out. During 2017 the band played slots at some of the UK's and European favourite festivals. Headlining a few of them along the way. They were on fire, playing to some of the largest audiences of their career including the famous Colours Of Ostrava festival in the Czech Republic. They ended the year heading back to Europe to play in Spain, Belgium and Holland. 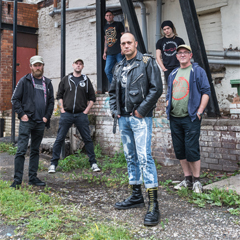 Ferocious Dog are a full-on six-piece band that encompass folk infused with rock, reggae and Celtic vibrations. The combination of instruments creates a palette of sound that offers infinite variations: going in hard to get the audience up and moving, or slipping into melodic passages and dub-like fusions. The songs are deeply personal and their fans can really identify with the words. Dan Booth, on fiddle, and John Leonard playing just about everything with strings, bring a huge amount of intricacy to the breakneck pace of their songs. Les Carter (ex Carter USM) on guitar and the rhythm section of Alex Smith and John Alexander hold things together brilliantly, and with Ken Bonsall's lyrics and sheer likeability, you have a whole greater than the sum of its parts. Ferocious Dog are well known and popular for their high octane live performances. 2017 saw the release of their latest studio album 'Red', which has been received with rave reviews. With Social Consciousness in mind, it is becoming public knowledge that at each gig, the band organise a Charity Food Drop for the homeless, liaising with the local Food Bands in the areas they play. Punters bring, nonperishable food, blankets, toiletries to the shows, and representatives from the food bank arrive to collect the goods, sometimes it amounts to a van full. The role of the infamous Hell Hounds must not be underestimated - an ever-growing legion of fans who follow the band up and down the country. They form Totem poles of people, in the most pit. They bring energy and passion to the gig whilst always welcoming the less initiated members of the crowd to join in and swell their ranks - everyone has a ball. 2018 promises to be another landmark year, with a tour to Kenya in February. A full UK album tour during March and April culminating in a headline show at Nottingham's Rock City. The band will also be playing more gigs and festivals in Europe and the UK. Many more exciting announcements to come.